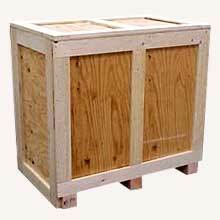 We offer plywood boxes made by the use of highest grade of wood. It is available in different shapes and sizes. This has the capability to withstand different types of weather and can be used for long storage items. Our pine wood boxes are multi stackable and multi handleable. They are effectively tested in terms of leakage with the help of various modern testing equipments. All these boxes can be manufactured by the company as per clientâï¿½ï¿½s specific requirements that make them a highly satisfactory product in marketing. In addition, we are a leading plywood storage boxes manufacturer and supplier of India.